Seventh annual rankings by Military Times factor in company culture and support for military franchisees. Veterans make outstanding franchise owners due to their commitment, trustworthiness and unmatched determination. ASP - America’s Swimming Pool Company announced their inclusion in the Military Times Best: Franchises 2018 rankings. Companies large and small participated in this annual evaluation, but only a select few made the cut on the Military Times Best list. 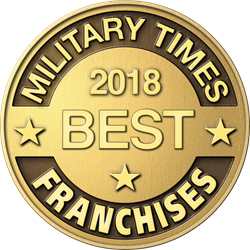 In their seventh year, the Military Times franchise rankings evaluated company culture, investment quality, overall franchising costs, military discounts and other non-financial supports, including support for franchisees in the National Guard and reserves. ASP offers some of the best opportunities for veterans interested in becoming franchisees. Since 2015, the company has awarded one qualified military veteran the opportunity to have their full franchise fee waived through the annual ASP Veteran Program. In addition to the franchise giveaway, other incentives include a 15 percent discount off the franchise fee for any qualified military veteran who becomes an ASP franchisee. All transitioning service members and veteran entrepreneurs can by apply by filling out a short form at ASPfranchising.com/veterans. A valuable resource for veterans – and a coveted honor for companies around the country – the annual Military Times rankings are the result of a meticulous, months-long process. Military Times invited franchise companies to fill out a rigorous survey of more than 100 questions, tested to ensure the accuracy of responses, carefully evaluated survey data and included only the best companies in its published rankings. To view the full list of Military Times Best: Franchises 2018 rankings, visit Rebootcamp.com, Military Times new website for transitioning service members, veterans and their families. ASP - America’s Swimming Pool Company is the largest swimming pool cleaning, repair, and renovation franchise system in the nation. Founded in 2002 by Stewart C. Vernon, the company is based on the belief that by providing a higher quality pool service at a reasonable price, the brand would raise the industry standards for pool service. In 2005, ASP began franchising and now covers over 400 cities in 20 states across the nation. For more information on ASP’s swimming pool franchise opportunities, visit ASPfranchising.com. For more information on America’s Swimming Pool Company, visit ASPPoolco.com or find us on Facebook @asppoolco. The Military Times digital platforms and newsweeklies are the trusted source for independent news and information for service members and their families. The military community relies on Air Force Times, Army Times, Marine Corps Times, and Navy Times for reporting on everything important to their lives, including: pay, benefits, finance, education, health care, recreational resources, retirement, promotions, product reviews, and entertainment. Military Times is published by Sightline Media Group. To learn more, visit http://www.militarytimes.com. Sightline Media is a global, multi-platform media company serving the U.S. military, federal government, the defense and federal IT sector, and the international defense community. Sightline’s media brands include the Military Times (Army Times, Navy Times, Air Force Times and Marine Corps Times), Defense News, Federal Times, C4ISRNET and FifthDomain.com. These brands are the go-to source for news and information about the U.S. military and the technology, business, politics and programs of federal and global defense markets. For more, go to sightlinemediagroup.com.